Did negligent security contribute to this parking lot shooting? Read Our Legal Take to find out if the victim may have a legal avenue for justice and a claim for compensation. 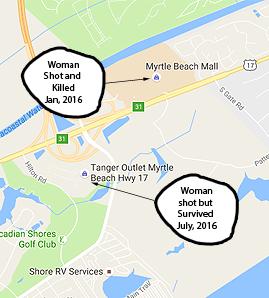 A woman was reportedly shot and injured during a robbery outside of the Myrtle Beach Tanger Outlets Thursday, July 28, 2016. The victim was reportedly “sitting in her car near a store’s exit…when two subjects approached her and said ‘this is a stick-up. '” One of the suspects apparently opened fire during the course of the robbery, striking the victim. She was transported to the hospital with injuries. “Thursday’s shooting marks the second time this year a woman was shot while sitting alone in a car in a Myrtle Beach shopping center parking lot,” The State reports. Parking lot patrons have a right to feel safe and secure on the property that they are visiting. The Murray Law Firm questions the level of security provided in the shopping center parking lot where this incident occurred and whether it may have been prevented. What parking lot security measures, such as bright lighting, security patrols, and surveillance cameras, were in place to protect patrons at the time of the shooting? Have there been prior incidents of violence on or near property? If so, were any additional security measures implemented by the parking lot or shopping center owners to deter crime? Generally, property owners are required to protect all patrons legally on the premises from any foreseeable harm. Should the facts of this matter reveal that the owner or management of the parking lot failed to provide adequate security to protect those on its premises, the victim may seek justice and elect to pursue a legal claim for her injuries.